I NEED TO...add voice to my applications. Learn all the reasons you should implement voice-enablement with Speakeasy. Watch how voice can boost your perfect order rate. 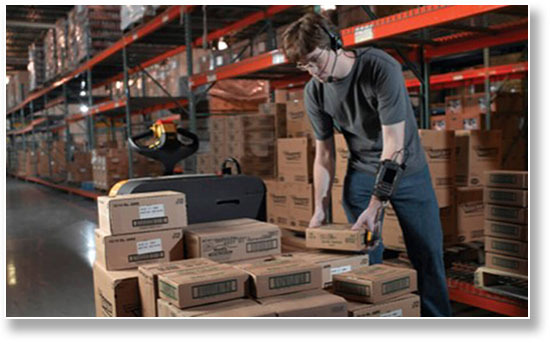 Unlock the hidden value from your warehouse operations with voice technology. Year after year, you’re challenged to find ways to boost worker productivity by 5% or more. Perhaps you considered voice in the past. Maybe the costs were too high. Or, maybe, it just didn't work. The good news is, voice enablement has evolved. Don't give up. Give it another try. The results could transform your entire operation. You want the hands-free and eyes-forward benefits voice can bring. Just walk, talk, and ALWAYS go. Every company wants to improve efficiency and drive down cost. The question is, how do you do it? One of the best ways is with voice-enabled applications from Ivanti (formerly Wavelink). The biggest productivity killer in many warehouses is unproductive travel time. Empower your team to work while they walk and talk. There's no training time, really. If your employees can talk, they can use Speakeasy. That's about it. Voice is part of a multi-modal data-capture solution. Add voice alongside barcode scanning, key entry, and more for an optimised data-collection process. Adding voice to your existing telnet and web apps is easy. Even better, there's no need to touch your host application (WMS, ERP, etc.). With our low costs, simple implementation, and quick training, you'll make your money back in no time. Some of our customers witness a positive ROI in less than 90 days. Your existing apps can tell workers the next instruction in their workflow, and workers can enter data back. Voice is a shortcut for your screens and keystrokes. Productivity will increase so much you'll have to re-set your goals. No more stopping to read a screen, scan, then read again. Just walk and talk. Travel and work. Many of our largest customers have reported that their biggest worry was the speed of voice implementation. Yet with Wavelink, implementation took 30 days on average—sometimes less. Be like Toshiba. Save $500,000. We LOVE it when customers tell us how simple Speakeasy is to implement and how much money it saved them. Toshiba staff said that before using Speakeasy the process was clumsy and time-consuming. The devices used in their two-step picking process were heavy and dependent on key-based data entry. Workers had to physically scan barcodes and type in data. Every order was taking 25% too long. So, they started looking for a voice solution. And after a lot of research they found Speakeasy. Modernised telnet and web apps for Android. Don't add voice to the mix because it's cool, or fun, or different. Add voice because it'll save you money and make your employees more productive. Supplements data collection via barcode scanning and RFID, as well as keyboard data entry via speech-to-text and text-to-speech. Bottom line: talk and stuff happens. Good stuff. Good stuff that saves you time and money. Add voice to existing telnet or web applications on Windows Mobile devices, or introduce voice with your new Android device deployment. Speakeasy leverages your mobile application interface to the host system, eliminating the need for expensive add-on software. Speakeasy uses device-based voice processing, so you don't need a server connexion to handle voice encoding/decoding. Many customers say bandwidth and servers were the reasons they hadn't gone to voice previously. Those concerns are gone.